The first step to ensure the success of your email campaign is to make sure your emails are delivered successfully. Your email should land in your subscriber’s inbox if it’s to have any impact. ­For this to happen, you need an email list verification tool. At the end of the list validation process, invalid email addresses are filtered out and you get a clean list for your campaign. Why is Email List Verification required? You may have gathered your email subscribers from completely legitimate sources (like the subscribe form on your website) but chances are that not all your email IDs are valid. According to Jupiter Research, more than 20 percent of email registrations contain typos, syntax, domain and other errors. Doing something as simple as sending to an old list where a specific threshold of email addresses bounces can set off your ESPs (Email Service Providers) threshold. And to add to it, bots keep pushing SPAM trap email addresses through systems every day. Too many bounced mails, trigger ISPs (Internet Service Providers) to block ESPs. To keep themselves safe, ESPs block clients with too many bounced emails. So to safeguard yourself from being blocked or marked as a spammer, it is important that you verify your list before sending out your mass mailer. How to verify or validate emails? If your email list has just a few subscribers, you can do it manually by going through each email ID one by one. But chances are your email list extends to thousands of subscribers. Going through each email ID would not only be time consuming and tedious but also be full of errors. 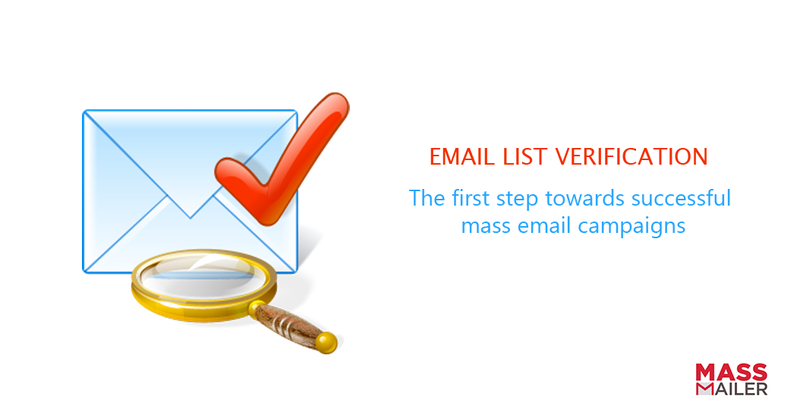 Thankfully, you can automate the process by using Email List Verification tools like MassMailer Email Verifier. You can save yourself from the trouble of going through each email ID, fasten the process of verification, have a clean list and most importantly, have your mails delivered to your subscriber’s inbox. You can easily use the tool to remove invalid emails from your customer databases, email marketing campaigns, or online newsletters and keep them out for good. You can easily create a campaign or create a MassMailer view, and submit the list to verify the emails, and get detailed reporting on your list. Continuing with our promise to make mass emailing easy for Salesforce users, we are proud to announce that MassMailer includes email list verification as an in-built feature. Now as a MassMailer user, you can have clean mailing lists and avoid being blocked by ESPs or ISPs. Send spam-free mails and take your email marketing campaign to the next level of success! If you are not a current user of MassMailer but use Salesforce CRM enterprise edition or above, you can sign up for MassMailer for a 15 Day FREE Trial and try Email Verifier feature as well.